The description of this book drew me in right away, it pretty much had everything that I love in a story. 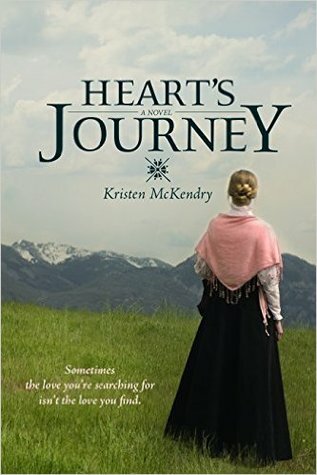 It was historical fiction, set in Canada- in Western Canada even! Plus it followed a spunky young woman on her travels across the country and a very handsome, kind man she meets along the way! There was also something about the cover that just really connected with me- maybe its because I'm a mountain girl at heart or maybe its because of my fascination with Canadian history. The cover has a very beautiful simplicity to it. I loved that whenever the setting was described I found myself nodding along because that is definitely Saskatchewan/Alberta/BC! I get how people might not understand just how tall the grass grows in the prairies, they assume its an exaggeration but my brother and I used to play hide and seek in the grass fields when we were kids! As well I've learned a lot about the history of this part of the country and I really liked to see how there were historically accurate elements with the various methods of travel and the harshness of the living off the land. I loved how spunky Rachel is and how determined she is to keep going on her journey, even though things are super tough. The story line was kind of predictable, I did pretty much guess what was going to happen but I didn't mind that. The characters were very compelling and even if I could guess what was going to happen to them, I still definitely wanted to find out for sure what happened. I probably looked silly whenever I read this book in public because the relationship between Rachel and Peter had me grinning. They had such a kind, wholesome relationship and yet they fought and argued and glared at each other and that made their relationship seem so real. I think its safe to say that Peter is my newest book crush! I would definitely recommend this book to all my friends looking for a 'university read'- an engaging, entertaining story with characters you can't help but love and a story that draws you in, without being a difficult read.